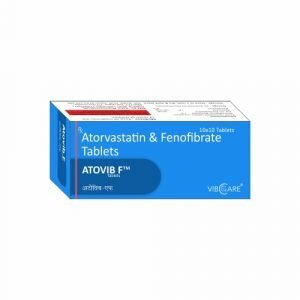 Atorvastatin (Lipitor) is a member of the drug class known as statins. It is used for lowering cholesterol. Atorvastatin is a competitive inhibitor of hydroxymethylglutaryl-coenzyme A (HMG-CoA) reductase, the rate-determining enzyme in cholesterol biosynthesis via the mevalonate pathway. HMG-CoA reductase catalyzes the conversion of HMG-CoA to mevalonate. Atorvastatin acts primarily in the liver. Decreased hepatic cholesterol levels increases hepatic uptake of cholesterol and reduces plasma cholesterol levels. Fenofibrate is a prodrug of fenofibric acid, an antilipemic agent which reduces both cholesterol and triglycerides in the blood. LD50=1600 mg/kg (Oral, in mice); Investigated as a teratogen and reproductive hazard. May be used as primary prevention in individuals with multiple risk factors for coronary heart disease (CHD) and as secondary prevention in individuals with CHD to reduce the risk of myocardial infarction (MI), stroke, angina, and revascularization procedures. May be used to reduce the risk of cardiovascular events in patients with acute coronary syndrome (ACS). May be used in the treatment of primary hypercholesterolemia and mixed dyslipidemia, homozygous familial hypercholesterolemia, primary dysbetalipoproteinemia, and/or hypertriglyeridemia as an adjunct to dietary therapy to decrease serum total and low-density lipoprotein cholesterol (LDL-C), apolipoprotein B (apoB), and triglyceride concentrations, while increasing high-density lipoprotein cholesterol (HDL-C) levels.